Seville's location in the south of Spain makes it an ideal starting point for exploring Andalusia. Pretty much everything in the region is reachable as a day trip, though some of the more remote spots can be awkward to reach in a day. Everything on this page is reachable by public transport, but sometimes it might be easier to hire a car or take a guided tour. There are some excellent one-, two- and three-day tours starting in Seville. See Carmona on the Way to Cordoba Though Cordoba is most easily visited on the high-speed AVE train, there is a guided tour that takes in Cordoba and Carmona on the same day. Granada on the Way to Malaga Granada is just an hour away from Malaga. If you plan on flying out of Malaga, visit Granada on the way from Seville. There are direct buses from Granada to Malaga so you don't even need to go into the city itself. Arcos de la Frontera and Ronda on the Same Trip Arcos and Ronda are both pueblos blancos - or 'white villages' - and can easily be visited in one day, as long as you have your own transport or you take this guided tour. Go to Morocco from Tarifa Visiting Tangiers in Morocco from Seville is difficult in a day because you first need to actually get to the ferry port. Of all the ports that have ferries to Morocco, Tarifa is the nicest. Why not spend a day in Tarifa whale watching or learning to windsurf, stay the night and then take the ferry to Morocco in the morning? Visiting Osuna en Route Elsewhere Osuna is a day trip from Seville, Granada and Malaga, perhaps even a half-day if you like to quickly check-in on the famous sights and say you've trodden where the great Houses of Westeros have walked. If you're traveling by car, it would be easy to pop into Osuna on the way from Seville to Granada or Malaga. Even better, combine it with a trip to Antequera (either en route between cities or as a double day trip). Antequera's dolmens and Lovers' Rock are also best seen by car. The city of Granada is one of Spain's most popular destinations. It is one of the last cities to maintain the tradition of giving free tapas with your food. And with the Alhambra fortress there too, you don't want to miss this city. Both the train and the bus take around three hours and cost about the same (around 20 euros). There are also some tours of Granada that include a visit to the Alhambra. Normally visiting the Alhambra on a day trip would be virtually impossible because of the queuing time. Cordoba is a nice old town to visit. Cordoba's Mezquita (mosque) is the biggest attraction here. The high-speed AVE train can get you from Seville to Cordoba in just 45 minutes, making it an excellent day trip from Seville to do by yourself. But if you want to include Carmona too (see below), you'll need to do a guided tour. 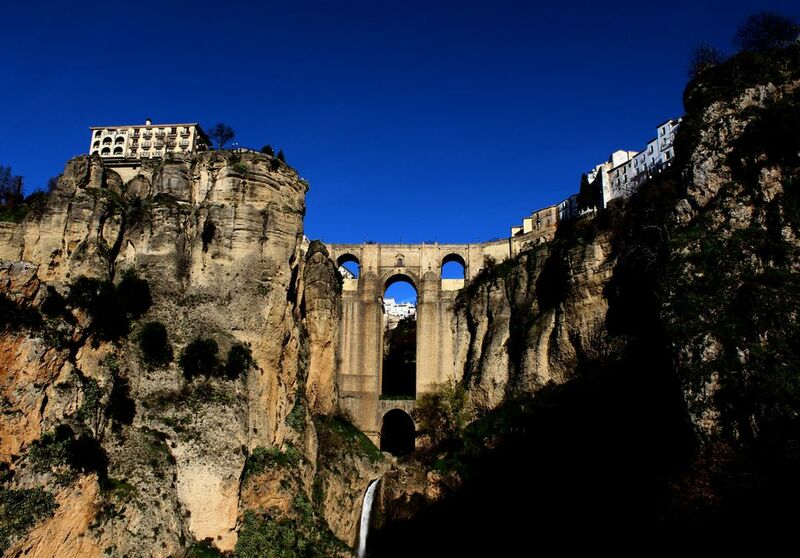 Probably the most famous of the pueblos blancos, Ronda is built astride a deep ravine, with impressive bridges joining the two sides. Take the bus to get to Ronda - it's run by Los Amarillos and departs from the Prado de San Sebastian Bus Station. Travel times vary greatly, but tickets always cost around 13 euros. As the bus journey is often well in excess of two hours (each way), it might be better to take a guided tour, which takes all the hassle out of the logistics and gets you into all the important sights. Arcos de la Frontera's unique position on a steep cliff makes this pueblo blanco visually one of the most interesting places to visit in this part of Andalusia. But it's only a small place, so after tapas you might want to head somewhere else. The best way to get from Seville to Arcos de la Frontera is to take a bus. Note that there are two bus stations in Seville. Buses depart from the San Sebastian del Prado bus station in Seville. Visit both Arcos de la Frontera and nearby Ronda on the same trip on this White Villages guided tour from Seville. A nice old town on a peninsula on the south coast, Cadiz has beaches, history, a nice climate and great fish. Easily reachable by train and bus, Cadiz it one of the most convenient Seville day trips. Travel times and prices are similar (just over an hour and a half and around 12 euros) It is also easy to combine Cadiz and Jerez in the same trip, such as this tour of Cadiz and Jerez from Seville. A small city, Jerez is famous for its sherry production and horse festival. Developing an appreciate for sherry in the city where it was invented is a great way to spend a few hours, and there's also the famous Jerez horse show, but there isn't much else to do in Jerez. It's best to combine it with a trip to Cadiz (book direct). Jerez is en route to Cadiz by bus and train. It costs around 7 euros and takes an hour, whichever form of transport you take. Good for windsurfing, whale watching and ferries to Morocco. Tarifa has a bit of a reputation for being a party town, which is not surprising considering the surfer 'dudes' that frequent the town. Let this dictate whether you want to spend the night here or not. There are several buses a day from Seville to Tarifa, but at three hours for the journey, this is not really day trip material. Book buses from ​movelia.es. The remains of the Roman city of Itálica, complete with Roman mosaics, amphitheater and baths. Archeological remains from the Roman ruins can be found in the nearby museum. Note that both the ruins and the museum are closed on Mondays. Take a local bus from the Plaza de Armas bus station to Santiponce, the town where Italica can be found. The journey takes about an hour. There is also a ​guided tour of Italica from Seville. Antequera is an interesting place to visit from Seville, Malaga or Granada, with its dolmens and Lovers' Rock and a pleasant old town. The most famous sight is the ancient Dolmen de Menga, much like the stone constructions found at Stonehenge in England. Also popular is the Peña de los Enamorados, or 'Lovers' Rock', a huge rock that resembles a human face. Legend has it that two lovers, one a Moor, one a Christian, killed themselves at this rock as their love was forbidden because of their differing religions. This is just outside the town and is best visited by car. Other sights include the Iglesia del Carmen, with its elaborately decorated interior and the Fuente de Piedra, a flamingo lake just a 40-minute drive from the town. Be aware: Antequera has two train stations, one of which (the one used by the high-speed AVE train) is miles out of town and with no bus transfer at the time of writing (the old service was canceled due to lack of interest), it's an expensive taxi ride for anyone not being picked up by a local. The bus is better. ALSA runs the bus service from Seville to Antequera - the journey takes between 1h30 and 2h30 and costs around 15€. Filming of parts of seasons five and six of HBO's Game of Thrones took place in Osuna as the setting for Dorne. Also, the Great Pit of Daznak was filmed at the bullring. Osuna should not be confused with Club Atletico Osasuna, which is a football team based in Pamplona, in the north of the country. Osuna is on two train lines: from Seville to Granada and from Seville to Malaga. There are trains every hour or two departing from Sevilla Santa Justa (and passing through Sevilla San Bernardo) and from Granada station. The journey takes just under an hour from Seville and an hour-and-a-half from Granada. Also on this train line are Antequera and Almeria. Carmona is a fortified city with a splendid main gate, the Puerta de Sevilla. Tickets to go up into the gate are under 3 euros. There is also the Roman burial ground, with its family tombs. To get to Carmona, take a local bus from the bus station at Prado de San Sebastian (that's the one that's not by the river. Buses leave frequently and take under an hour. There is no train. Carmona can be visited as part of a guided tour of Cordoba. Matalascañas a no-thrills affair, with just a few shops and cafes and some ugly hotels, but it does have sun, sea, sand and ice cream. Take the bus from Plaza de Armas bus station. There is also a ​guided tour of Doñana Natural Park and Matalascañas Beach. Have a taste of Africa in Tangier on the northern tip of Morocco. Working out the logistics of traveling from Seville to Morocco is not easy as a day trip: really, a ​guided tour of Tangiers from Seville is your only sensible option.